How To Care Blood Parrot . Shelled Pea Is A Good For Parrot ! 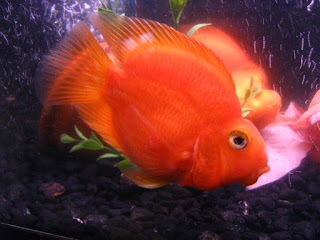 HomeAQUARIUMHow To Care Blood Parrot . Shelled Pea Is A Good For Parrot ! BLOOD PARROT'S TANK, FILTER, CARE, DIET, AND DISEASES. Shelled Pea Is A Good For Parrot! Blood Parrot cichlids can grow as large as 10 inches (25 cm) long. For this reason, you'll need to buy at least a 30-35 gallons (113-132 L) tank if you want to keep only one fish aditional 10 gallons (38L) for every other one. Parrot cichlids are large fish with healthy appetites. Their tendency to dig in the substrate can stir up dirt and algae. This is why they require a good filter. Keep the aquarium temperature of about 76 to 84 °F (24 to 29 °C). Temperatures below 80 °F (27 °C) might cause some disease. Parrot cichlids like to dig, so make sure the substrate is soft, like fine sand. Hiding places are a must for these fish, so make sure there are a lot of caves, clay pots, pieces of driftwood, or rocks, but allow for large open swimming spaces as well. Weekly water is very important for parrot fish. At least 20-25% water change in the tank. Clean any algae growing on glass, substrate and other kinds of stuff. The lighting shouldn't be too bright, as cichlids prefer darker waters in the wild. Keep the wattage between 0.5 and 1 watt per gallon (4 L). A well-balanced diet is a key to having healthy fish, besides keeping water in good condition. These fish usually eat anything they can fit in their mouths, as they are omnivorous feeders. Proper food includes brine shrimp, bloodworms, tropical flakes, sinking pellets, and commercial parrot cichlid food. Foods high in b-carotene and canthaxanthin will help maintain their vibrant colors. Feed your fish at least twice a day. Parrot cichlids are rather territorial and will act aggressively toward smaller fish. If you choose to add other fish, consider Sivram, Silver Dollar, Bala sharks, black skirt tetras, convict cichlids and other semi-aggressive fish nearly the size of the parrot cichlid. Avoid smaller Tettars, Discus, Dianios, and others. Lack of properly ample hiding places, together with poor water quality, exposes the Blood Red Parrots to great stress, which will affect their immune system. The first illness they are exposed to is Ich, which thrives on vulnerable fish, helping it spread. If you notice any signs of Ich, raise the tank temperature to 86 °F (30 °C) for three days. This should kill the parasite. If this does not work, you can treat the Ich with copper-based chemicals, but make sure there are no water conditioners left. Kill off the Ich in the original tank with aquarium salts, which you can buy in pet supply stores. Add one teaspoon (5 g) per gallon (4 L) of water every 12 hours for 36 hours. Let the salt remain in the tank for 7 to 10 days. 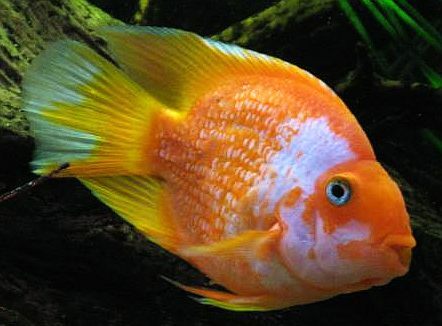 Blood parrot cichlids have parrot-like mouths and back humps. This unique anatomy puts them at risk for swim bladder disease. In this condition, the fish gets constipated and swims at an awkward angle. To correct this problem, feed the fish two to three shelled peas once a week to regulate the bowels. What Lucky Bamboo Is A Fortuitous Plant ?